Well we finally got back into the saddle and had ourselves a gaggle of friends and family for a lovely Friday night dinner. The menu was fun to create as we needed a recipe that could be eaten by both carnivores and vegans 🙂 After going through our recipes, we fell upon a decent idea, making two of the same dish, one with meat and one with a suitable substitute. The best option for that direction was our Sausage Stew recipe, the carnivore version was made with Neshama’s sausages; Breakfast Delight and Country Apple, and the vegan version with Tofurky’s Italian Sausage. The cool aspect of making the same recipe for both types of diets are that the dish stays the same, as does the recipe and ingredients (other than protein), along with same timing for the vegetables, and same completion time. In other words; cooking made fun and easy. We started with a course of smoked salmon, green and black olives, hummus, and my wife’s killer whole wheat challah. We followed that with the main course of the two stews, while my wife made some spinach kugel (parve souffle), along with some nice fresh green salad. The wines were paired well, I think. Some were clear winners, while some were not perceived by all as winners during the meal, and then there were the filthy, sick, and wild wines that were winners at the dinner and after. The winners were the 2001 Capcanes Peraj H’Abib, which is in the DRINK up state, enjoy it before you regret it! 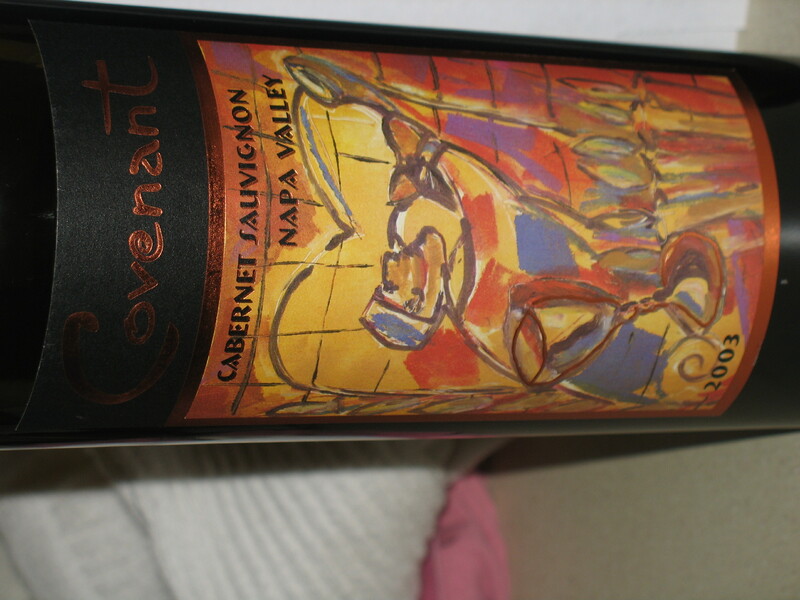 SUPER kudos go out to the Covenant Winery, who also had an entry in the winner’s circle, their 2003 Covenant Cabernet Sauvignon, which was from their maiden voyage. I am so happy that I held on to it to be enjoying it now. 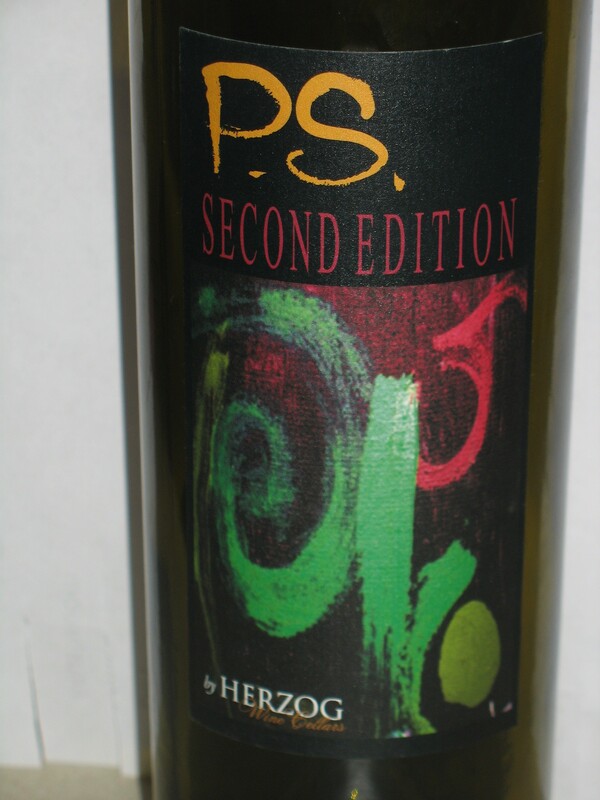 Finally, to be honest I whiffed on two wines; the 2009 Herzog Petite Sirah Second Edition and the 1996 Four Gates unoaked Chardonnay! Talk about messing up! I did not like either when we opened them, but WOW did that change fast. The two of them were drinking lovely a few hours later, while the Petite Sirah was better the next day. 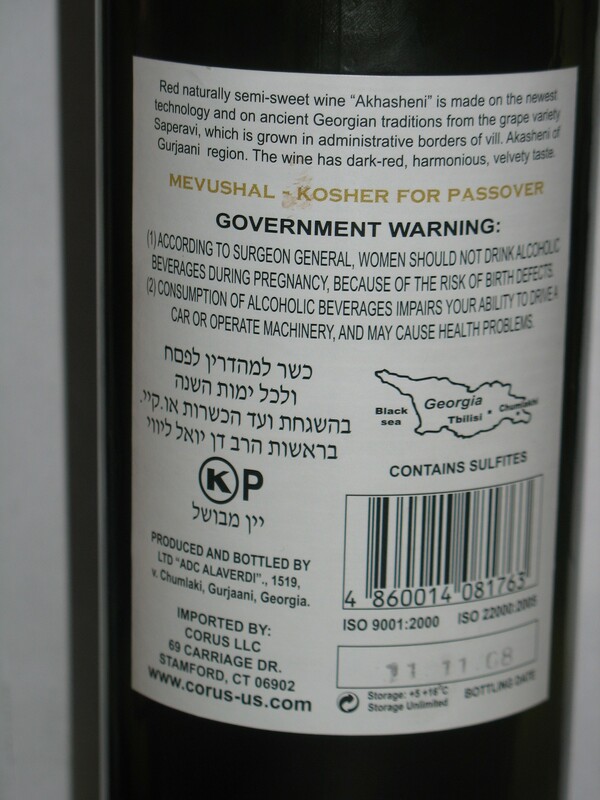 Finally a friend of ours brought a surprise, a Kosher Akhasheni Georgian wine! 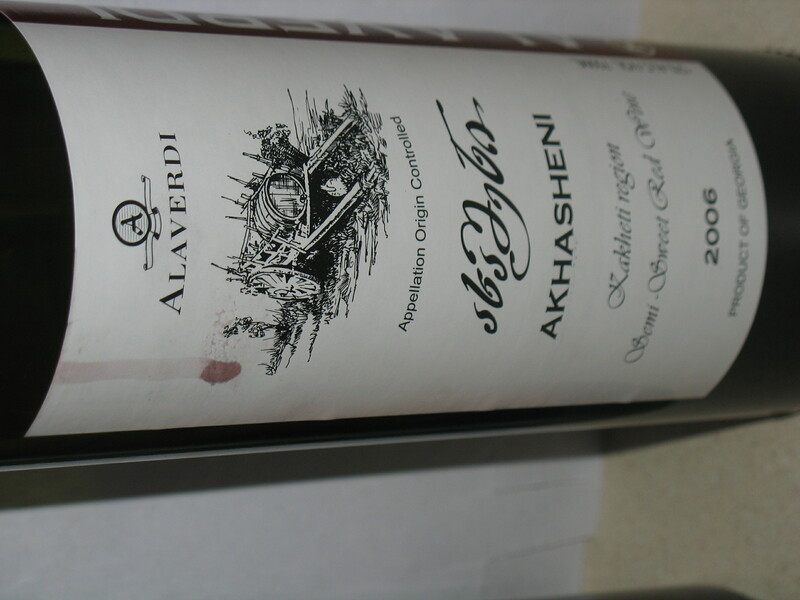 The grapes used in this wine are called: Saperavi from the Akhasheni vineyards of the Gurdzhaani district in Kakheti, a province of Georgia. Truly a shadow of its former self. It is dead and dying quickly, all at the same time. Some liked the wine, but not me. The nose on this dark ruby with serious brown halos colored wine has notes of dark cherry, aging raspberry, barn yard notes, vanilla, and stony rocks. The mouth on this medium bodied wine died off quickly with deep minerality, dark cherry, raspberry, and vanilla. The wine tasted old and dying, its structure was spicy and brambly with minerality with dark red fruit and still nice acid. Wow this wine was clearly not on my radar, and was a really nice surprise from Benyo; I did not know it existed. We have posted in the past about its bigger oaked siblings (sulfur and non-sulfur), but I had no idea this one was lying around in the Four Gates cellar. The nose on this wine did not start nicely out of the bottle, but heck, how do you think you would smell if you were lying around in a dusty cellar for 15 years! Two or three hours later this light gold colored wine was hitting its stride, with clear and lovely notes of pineapple, grapefruit, lemon, citrus, white peach, and lychee. The mouth on this full bodied wine was channeling it inner nose, with pronounced pineapple, grapefruit, citrus, and peach. The mid palate was packed with core acid and lovely fruit. The finish was long and luscious with more summer fruit, pineapple, and a hint of grass and/or minerality. The nose on this black colored wine starts off closed and very unapproachable. However with time, the nose explodes with black cherry, blackberry, plum, hints of blueberry, black currant, light mocha, tar, tobacco, mounds of black pepper, roasted meats, oak, and floral notes of rose or violet. The mouth on this full bodied wine becomes rich and mouth coating with lovely tannins that are soft but still integrating. Along with pepper, tar, blackcurrant blackberry, and a hint of blueberry. The mid palate is packed with acid, tar, tobacco, oak, and lovely floral notes. The finish starts off stunted and short – DO NOT fret, it will open! The finish is long and sensuous with mocha, floral notes, blackcurrant, tobacco, and black pepper. Floral notes, blackcurrant, tobacco, blackberry, and oak linger long after the wine is gone. I know Daniel Rogov believes this wine is still alive and active, but the bottle I had was not over its peak, but clearly not as enjoyable as the one he tasted. It was nice but lacked so much body that it felt dead. The tannins and acid on this wine are clearly still kicking but I do not believe this wine is getting any better – drink up and open one hour in advance. The nose on this dark garnet to mahogany colored wine is filled with tobacco, chocolate, cedar, raspberry, blackberry, herbs, and lovely dirt. The mouth on this medium bodied wine was nice and round with lovely tannin, blackberry, raspberry, and a touch of currant. The mid palate is bracing with acid, tannin, chocolate, herbs, and smoky characteristics. The finish is long, nice, and smoky with oak, blackberry, raspberry, dirt, chocolate, and herbs. Drink UP!!! Drink up – this wine is lovely but is really at its peak or a drop past it!! The score from previous tasting is a bit lower then the first score we gave this wine, and the same as my second tasting, but not because of tannins. Rather the score is a bit lower this time because of the color and age on the bottle. The notes are very much in line with my previous tasting except for color and tannin, but the structure is the same. I recommend opening the bottle 1 hour ahead of time, and NO more than that and enjoying it then. This bottle will not last four hours after opening, so drink now and enjoy. The nose on this deep black colored wine, with a bit of a brown halo, is popping with blackberry, plum, cassis, sweet cedar, herbs, raspberry, licorice, and tobacco. The mouth on this full bodied and mouth coating wine is now smooth and layered with blackberry, plum, black currant, and cassis. The mid palate is packed with lovely tannins, bright acidity, and concentrated black fruit that comes at you in layers. The finish is super long, spicy, and concentrated with cloves, herbs, blackberry, plum, raspberry, chocolate, tobacco, and sweet cedar. The wine lingers long with cedar, plum, tobacco, vanilla, and chocolate. Are you kidding me! This wine is as close to “filthy” as it gets without being covered in dirt and muck! This puppy is downright crazy, lovely, and insane! This wine was the clear winner of the evening, even against my clear, biased wines that I have a love affair with, the 1996 Four Gates Chardonnay and the 2001 Capcanes. Both were really nice, but in the end, fell a bit short, each for different reasons. This wine was the clear winner, and for bloody good reason! One other crazy thought, when this wine finally calmed down and lost some of its special characteristics, it was VERY close to the Capcanes. To the point where they were almost brothers, excepting for the color, where the Capcanes was clearly going brown and the Covenant being black as day. The nose on this dark garnet to black colored wine is packed with rich ripe blackberry, tobacco, chocolate/mocha, crushed herbs, black currant, vanilla, raspberry, plum, and sweet oak. The mouth on this blockbuster medium to full bodied wine is concentrated, layered and mouth coating with lovely and almost integrated tannins, blackberry, black currant, raspberry, and ripe plum. The mid palate flows off the mouth with balancing acid, sweet oak, mocha, tobacco, and more nice tannins. The finish is long, spicy, and continuous and, while maybe being the best part of this wine, which is saying a lot, with sweet cedar in the fire box, a long puff from a fat stogie, a warm cup of mocha in your hand, while munching on blackberry, black currant, and vanilla. Tobacco, plum, blackberry, and sweet cedar linger long on the palate. This is a clear and powerful wine and one that when compared side by side with the other wines we enjoyed in the evening came across as over the top. The nose on this dark garnet colored wine was screaming with extra ripe and sweet plum, blackberry, and cassis, along with spicy oak, crushed herbs, and tobacco. The mouth on this intense and full bodied wine hits you up front with super ripe fruit, spicy and still active tannin, and cassis, blackberry, and plum. The mid palate is balanced with nice acidity, sweet cedar, lovely tannin, and sweet cedar. The finish is super long and extracted with tobacco, oak, black fruit and herbs. A nice wine that is fine for a couple more years but one I always have trouble with given its intensely ripe black fruit and mounds of oak. The nose on this dark garnet to black colored wine is hopping with dark cherry, candied fruit, perfumed nose, floral notes of violet, lovely chocolate, dates, and spice. The mouth on this full bodied wine is velvety, mouth coating, and enriched by the residual sugar of this semi-sweet wine, along with dark cherry, date, nice tannin, a bit too much residual sweetness, and candied fruit. The mid palate is balanced with acid, lovely tannin, oak, chocolate, and spice. The finish is super long and rich with candied fruit, sweetness, cherry, and oak. The wine linger long with chocolate, date, and spice. Posted on March 16, 2011, in Food and drink, Kosher Red Wine, Kosher Rose Wine, Kosher Semi Sweet Wine, Wine and tagged Akhasheni, Cabernet Sauvignon, Capcanes, Chardonnay, Chateau Labegorce Lede Margaux, Covenant Winery, Four Gates Winery, Galil Mountain Winery, Herzog Cellars Winery, Merlot, Peraj Ha'Abib, Petite Sirah, Pinot Noir, Yarden Winery. Bookmark the permalink. 3 Comments.